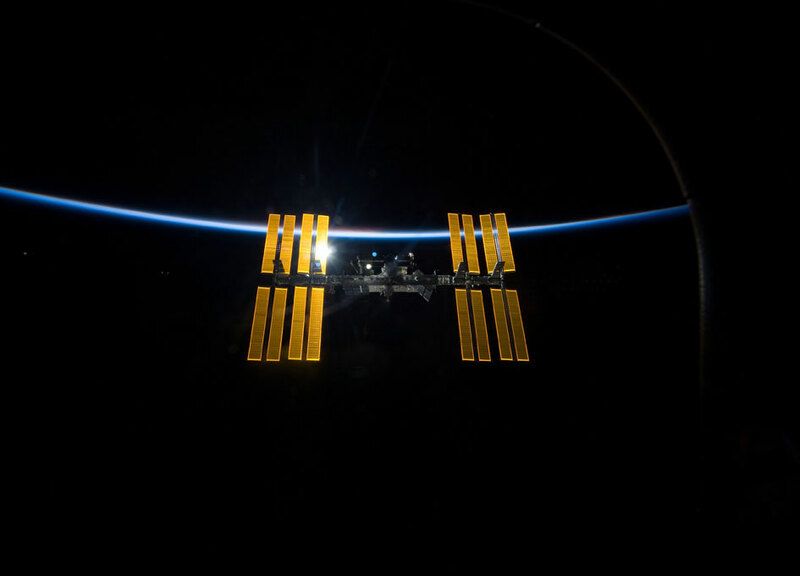 NASA Space Station On-Orbit Status 2 July 2018 - Dragon Docked for Month Long Stay. Three days after its launch from Florida, the SpaceX Dragon cargo spacecraft was installed on the Earth-facing side of the International Space Station's Harmony module at 9:52 a.m. EDT. SpX-15 Mission: At 5:56 AM CDT, the ISS crew used the Space Station Remote Manipulator System (SSRMS) to capture the Dragon vehicle. Ground specialists then maneuvered the spacecraft to the pre-install position where they performed an inspection of the Passive Common Berthing Mechanism (PCBM). Once complete, Dragon was berthed to the Node2 Nadir port at 09:38 AM CDT and the crew completed vestibule pressurization, leak checks, vestibule outfitting, and CBM Control Panel Assembly (CPA) rotation in support of tomorrow morning's scheduled ingress. OA-9 Hatch Closure: The crew has completed loading all trash into the Cygnus vehicle and have closed both the Cygnus and N1 Nader hatches; in this configuration, the crew can temp-stow cargo in the N1 Deck 2 (NO1D2) area. Power and data cables to the spacecraft will remain connected, however, until closer to the planned unberth date of 15-July. MagVector 3D: The crew exchanged a MagVector 3D sample today. A total of 12 different samples will be processed on the ISS (1 per day). ESA's MagVector investigation supports a study of how Earth's magnetic field interacts with an electrical conductor. Using extremely sensitive magnetic sensors placed around and above a conductor, researchers can gain insight into ways that the magnetic field influences how conductors work. This research is expected to help improve future ISS experiments and electrical experiments, and could also offer insights into how magnetic fields influence electrical conductors in general. Microgravity Investigation of Cement Solidification (MICS): Today the crew transferred a MICS ampoule kit to the ISS Portable Glovebag in order to break two ampoules in each sample bag and mix the contents with a spatula. The crew then returned each sample bag to the kit bag, which will be stowed for return. A total of eight MICS sessions are planned. The MICS investigation supports the evaluation of microstructure and material properties of benchmark cement samples. Different responses to thermal and mechanical loading are expected and will be characterized in detail. Positive attributes found in the hardening process due to the microgravity environment aboard the ISS will be reported with the intent of improving Earth-based cement and concrete processing. Space Test Program - Houston 5 (STP-H5): The crew took still photos of the Cyclops ICE experiment strips through the Cupola and Japanese Experiment Module (JEM) windows. STP-H5 is an external payload consisting of 13 individual experiments ranging from technology demonstrations to space and terrestrial weather measuring and monitoring. The experiments are provided and operated by the US Department of Defense and NASA agencies. Biological Experiment Laboratory (BioLab): The crew performed troubleshooting steps for the Biolab Incubator Door Locking Bolt today. A previous effort to replace the bolt on June 7th was unsuccessful after the bolt threads failed to engage. The BioLab is a multiuser research facility located in the Columbus laboratory. It is used to perform space biology experiments on microorganisms, cells, tissue cultures, small plants, and small invertebrates. BioLab allows scientists to gain a better understanding of the effects of microgravity and space radiation on biological organisms. Tropical Cyclone: The crew configured the camera settings in the Cupola to support the capture of untended images of Kilauea Volcano, Hawaii. ALGOMETRIA. Pressure and Thermal Algometry preparation and measurement session. Recovery of distiller as part of RS [СРВ-У]. Tuesday, 07/03: Dragon Center Stack Transfer, DCB Unpack, TangoLab Card R&R, Generic Cargo Ops, ANGX Ops, RR7 Habitat Transfer.